The French Air Force (French: Armée de l'Air Française) [aʀme də lɛʀ], literally Army of the Air) is the air force of the French Armed Forces. It was formed in 1909 as the Service Aéronautique, a service arm of the French Army, then was made an independent military arm in 1934. The number of aircraft in service with the French Air Force varies depending on source, however sources from the French Ministry of Defence give a figure of 658 aircraft in 2014. The French Air Force has 225 combat aircraft in service, with the majority being 117 Dassault Mirage 2000 and 108 Dassault Rafale. As of early 2017, the French Air Force employs a total of 41,160 regular personnel. The reserve element of the air force consisted of 5,187 personnel of the Operational Reserve. 687 aircraft, of which 226 are combat aircraft. 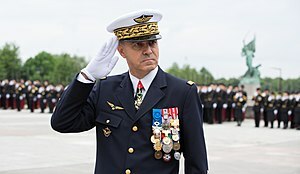 The Chief of Staff of the French Air Force (CEMAA) is a direct subordinate of the Chief of the Defence Staff (CEMA). French military aviation was born in 1909. After the approval of the law by the French National Assembly on March 29, 1912, French Military Aeronautics became officially part of the French Army, alongside the four traditional branches of the French Army, the infantry, cavalry, artillery and engineers. Military Aeronautics was established as a "special arm" by the law of December 8, 1922. however, the later remained under the auspices of the French Army. It wasn't until July 2, 1934, that the "special arm" became an independent service and was totally independent. The initial air arm was also the cradle of French military parachuting, responsible for the first formation of the " Air Infantry Groups " Groupements de l'Infanterie de l'Air in the 1930s, out of which the Air Parachute Commandos (French: commandos parachutistes de l'air) descended. The French Air Force maintained a continuous presence across the French colonial empire particularly from the 1920s to 1943. The French Air Force played an important role, most notable during the Battle of France of 1940. The engagement of the Free French Air Forces from 1940 to 1943, then the engagement of the aviators of the French Liberation Army, were equally marking episodes of the History of the French Air Force. The sacrifices of Commandant René Mouchotte and Lieutenant Marcel Beau illustrated their devotion. The Vichy French Air Force had a significant presence in the French Levant. After 1945, France rebuilt its aircraft industry. The French Air Force participated in several colonial wars during the Empire such as French Indochina after the Second World War. Since 1945, the French Air Force was notably engaged in Indochina (1945–1954). The French Air Force was also active in Algeria from 1952 until 1962 and Suez (1956), then later Mauritania and Chad, the Persian Gulf (1990–1991), ex-Yugoslavia and more recently in Afghanistan, Mali and Iraq. From 1964 until 1971 the French Air Force had the unique responsibility for the French nuclear arm via Dassault Mirage IV or ballistic missiles of Air Base 200 Apt-Saint-Christol on the Plateau d'Albion. Accordingly, from 1962, the French political leadership reprioritized its military emphasis on nuclear deterrence, implementing a complete reorganisation of the Air Force, with the creation of four air regions and seven major specialised commands, among which were the Strategic Air Forces Command, COTAM, the Air Command of Aerial Defense Forces (French: Commandement Air des Forces de Défense Aérienne, CAFDA), and the Force aérienne tactique (FATac). In 1964 the Second Tactical Air Command was created at Nancy to take command of air units stationed in France but not assigned to NATO. The Military Air Transport Command had previously been formed in February 1962 from the Groupement d'Unités Aériennes Spécialisées. Also created in 1964 was the Escadron des Fusiliers Commandos de l'Air (EFCA), seemingly grouping all FCA units. The Dassault Mirage IV, the principal French strategic bomber, was designed to strike Soviet positions as part of the French nuclear triad. In 1985, the Air Force had four major flying commands, the Strategic Air Forces Command, the Tactical Air Forces Command, the Military Air Transport Command, and CAFDA (air defence). CFAS had two squadrons of S2 and S-3 IRBMs at the Plateau d'Albion, six squadrons of Mirage IVAs (at Mont de Marsan, Cazaux, Orange, Istres, St Dizier, and EB 3/94 at Luxeuil), and three squadrons of C-135F, as well as a training/reconnaissance unit, CIFAS 328, at Bordeaux. The tactical air command included wings EC 3, EC 4, EC 7, EC 11, EC 13, and ER 33, with a total of 19 squadrons of Mirage III, Jaguars, two squadrons flying the Mirage 5F (EC 2/13 and EC 3/13, both at Colmar), and a squadron flying the Mirage F.1CR. CoTAM counted 28 squadrons, of which ten were fixed-wing transport squadrons, and the remainder helicopter and liaison squadrons, at least five of which were overseas. CAFDA numbered 14 squadrons mostly flying the Mirage F.1C. Two other commands had flying units, the Air Force Training Command, and the Air Force Transmissions Command, with four squadrons and three trials units. Dassault Aviation led the way mainly with delta-wing designs, which formed the basis for the Dassault Mirage III series of fighter jets. The Mirage demonstrated its abilities in the Six-Day War, Yom Kippur War, the Falklands War, and the Gulf War, becoming one of the most popular jet fighters of its day, selling very widely. In 1994 the Commandment of the Fusiliers Commandos de l'Air was reestablished under a different form. The French Air Force is expanding and replacing its aircraft inventory. The Air Force is awaiting the Airbus A400M military transport aircraft, which is still in development. As of late November 2016, 11 A400M aircraft had been delivered to ET00.061 at Orleans-Bricy, and integration of the new Dassault Rafale multi-role jet fighter was underway, whose first squadron of 20 aircraft became operational in 2006 at Saint-Dizier. In 2009 France rejoined the NATO Military Command Structure, having been absent since 1966. France was also a lead nation, alongside the United States, Great Britain and Italy in implementing the UN sponsored no-fly zone in Libya (NATO Operation Unified Protector), deploying 20 fighter aircraft to Benghazi in defense of rebel held positions and the civilian population. The last remaining squadron of Dassault Mirage F1s were retired in July 2014 and replaced by the Dassault Rafale. Général d'armée aérienne André Lanata, chief of staff of the Armée de l'Air. The Chief of Staff of the French Air Force (CEMAA) determines French Air Force doctrines application and advises the Chief of the Defence Staff (CEMA) on the deployment, manner, and use of the Air Force. He is responsible for the preparation and logistic support of the French Air Force. The CEMAA is assisted by a Deputy Chief, the Major Général de de l'Armée de l'Air. Finally, the CEMAA is assisted by the Inspectorate of the French Air Force (IAA) and by the French Air Force Health Service Inspection (ISSAA). The Air Force is organized in conformity to Chapter 4/ Title II/ Book II of the Third Part of the Defense Code (French: code de la Défense), which replaced decree n° 91-672 of July 14, 1991. Air Force headquarters is co-located, alongside the Chief of the Defence Staff's offices (EMA) as well with Army and Navy headquarters at the Ballard site, more commonly known as the " French Pentagon " or " Balardgone ". It numbers 150 aviators. The new site succeeds the former Paris Air Base (BA 117), the air staff headquarters buildings, dissolved on June 25, 2015. The French Air Force has three commands: two grand operational commands (CDAOA and CFAS) and one organic command (CFA)). Air Defense and Air Operations Command (French: Commandement de la Défense Aérienne et des Opérations Aériennes (CDAOA)), is responsible for surveillance of French airspace, as well as all aerial operations in progress. This command does not possess aircraft. Instead it exercises operational control over units of the Air Forces Command. Strategic Air Forces Command (CFAS)), is responsible for the air force's nuclear strike units (Mirage 2000 N and Dassault Rafale armed with ASMP-A missiles), as well as the tanker / strategic transport aircraft (C-135FR, Boeing KC-135 Stratotanker). Fighter Brigade – (French: Brigade Aérienne de l'Aviation de Chasse (BAAC)), is responsible for all air defense, air-to-ground and reconnaissance aircraft (including Dassault Rafale, Mirage 2000-5F, Mirage 2000B/C/D, Transall C-160 Gabriel). In February 2016 it was commanded by Brigadier General (Air) Philippe Lavigne. Airspace Control Brigade (French: Brigade Aérienne de Contrôle de l'Espace (BACE)), is responsible for (Airborne early warning and control aircraft, and ground radar, ground-based air defense systems and missile defence, communication networks) airspace surveillance, constituting the Système de Commandement et de Conduite des Opérations Aérospatiales). Since 2007 the command, control and information systems network of the air force have been is integrated into the Joint Directorate of Infrastructure Networks and Information Systems (DIRISI)). Air Force Aerial Weapon Systems Brigade (French: Brigade Aérienne des Systèmes d'Armes Aériens (BASAA)) provides the maintenance and repair of aerial weapons and target systems. Air Force Maneuver Support Brigade (French: Brigade Aérienne d'Appui à la Manœuvre Aérienne (BAAMA)) provides the ground-based engineer and logistics personnel (including expeditionary) needed for the sustainment of air operations. These last two brigades belonged until 2013 to the Air Force Support Command (CSFA), which maintained the arms systems, equipment, information and communication systems (SIC) as well as infrastructure; the CSFA supported the human element, the military logistics (supply and transport), wherever forces of the French Air Force operated or trained; these two brigades are now subordinated to the CFA. All air regions were disestablished on 1 January 2008. In the 1960s, there were five air regions (RA). The number was then reduced to four by a decree of June 30, 1962 with the disestablishment of the 5th Aerial Region (French North Africa). The decree of July 14, 1991 reduced the air regions to three: « RA Atlantic », « RA Mediterranean » and « RA North-East ». On July 1, 2000 was placed into effect an organization consisting of « RA North » (RAN) and « RA South » (RAS). The territorial division was abolished by decree n°2007-601 of April 26, 2007 · . From 2008 to 2010 the French Air Force underwent the "Air 2010" streamlining process. The main targets of this project were to simplify the command structure, to regroup all military and civil air force functions and to rationalise and optimise all air force units. Five major commands, were formed, instead of the former 13, and several commands and units were disbanded. The Air Force directs the Joint Space Command. The Directorate of Human Resources of the Air Force (DRH-AA) recruits, forms, manages administers and converts personnel of the French Air Force. Since January 2008, the DRH-AA groups the former directorate of military personnel of the French Air Force (DPMMA) and some tasks of the former Air Force Training Command. The directorate is responsible for Air Force recruitment via the recruiting bureau. The Integrated Structure of Maintaining Operational Conditioning of Aeronautical Defense Materials (French: Structure Intégrée de Maintien en Condition Opérationnelle des Matériels Aéronautiques de la Défense) (SIMMAD). The Aeronautical Industrial Service (French: Service Industriel de l'Aéronautique) (SIAE). The " Air Commissariat " (French: " Commissariat de l'Air ") between 1947 and 2007, then " Financial and General Administration Service " (French: " Service de l'Administration Générale et des Finances " (SAGF)) from 2008 until 2009, and finally the " Commissariat Service of the Armed Forces " (SCA) (French: Service du Commissariat des Armées) since 2010, have successively been designated as administrative services of the French Air Force. The Commissioners as well as Civilians of this service carry out : operations support, individual legal rights, judicial, internal control accountability, financial and purchase executions, and support and protection of the combatant. units of maintenance and support. Escadres (wings) were dissolved from 1993 as part of the Armées 2000 reorganisation, were reestablished in 2014. The problems caused by having the aircraft maintenance units not responsible to the flying squadrons they supported eventually forced the change. the 30e Escadre de Chasse at Mont-de-Marsan Air Base (3 September 2015). Also established was the Escadre Aérienne de Commandement et de Conduite Projetable (French: Escadre Aérienne de Commandement et de Conduite Projetable) at Évreux-Fauville Air Base on 27 August 2015. The French Air Force also announced in August 2015 that unit numbering, moves of affected aircraft, and the transfer of historic material (flags, traditions and names) would be completed in 2016.
the 62e Escadre de Transport was re-constituted at Orléans – Bricy Air Base on September 5, 2017 taking over C-130 Hercules operations from 61e Escadre de Transport, so the latter can specialise in operating the A400M Atlas. Commanded by a lieutenant-colonel, the Escadron is the basic operational unit. This term replaced that of Group as of 1949 with the aim to standardize usage with the allies of NATO who were using the term 'squadron'. However, the term Group did not entirely disappear: the term was retained for the Aerial Group 56 Mix Vaucluse, specialized in Special Operations or Group – Groupe de Ravitaillement en Vol 02.091 Bretagne (French: Groupe de Ravitaillement en Vol 02.091 Bretagne) which is still carrying the same designation since 2004. A fighter squadron (escadron) can number some twenty machines, spread in general in three Escadrilles. A Transport Escadron (French: Escadron de Transport) can theoretically count a dozen Transall C-160, however, numbers are usually much less for heavier aircraft (three Airbus A310-300 and two Airbus A340-200 for the Transport Escadron 3/60 Estérel (French: Escadron de Transport 3/60 Estérel)). The squadrons have retained the designations of the former Escadres disbanded during in the 1990s. For instance: Transport Escadron 1/64 Béarn (French: escadron de transport 1/64 Béarn) (more specifically Transport Escadron 01.064 Béarn), which belonged to the 64th Transport Escadre (French: 64e Escadre de Transport) during the dissolution of the later (recreated on August 2015). Not all escadrons (Squadrons) are necessarily attached to an Escadre. The Escadrille (flight) has both an administrative and operational function, even of the essential operational control is done at the level of the Esacdron. A pilot is assigned to the Escadrille, however the equipment and material devices, on the other hand, are assigned to the Escadron. Since the putting into effect of the ESTA (Aeronautic Technical Support Escadrons), material devices and the mechanics are assigned directly to the base then put at disposition of the based Escadrons. The Escadrilles adopted the traditions of the prestigious units out of which most (SPA and SAL),[note 1] are those traditions of the First World War. Protection Squadrons protect airbases inside and outside the national territory, and in exterior operations as well. The CPAs carry out common missions, as well as specialized tasks; including intervention and reinforcement of protection at the profit of sensible points " air " inside and outside the national territory. AirFlying activity in France is carried out by a network of bases, platforms and French air defence radar systems. It is supported by bases, which are supervised and maintained by staff, centres of operations, warehouses, workshops, and schools. Both in France and abroad, bases have similar infrastructure to provide standardised support. Within the metropolitan territory of France, 27 airbases, out of the which 18 aeronautical platform with perceived runways and 5 Bases non-platform, two schools, 3 air detachments and " one attached air element " (EAR). Beyond the metropole/Europe, 7 Aerial Bases or permanent detachments in overseas or country. Crotale missile-launchers of the Air Defense Ground-to-Air Squadron of the French Air Force. Some French air bases house radar units (e.g. Lyon, Mont-Verdun, Drachenbronn, Cinq-Mars-la-Pile, Nice, Mont-Agel) to carry out air defence radar surveillance and air traffic control. Others house material warehouses or command posts. Temporary and semi-permanent foreign deployments include transport aircraft at Dushanbe (Tajikistan, Operation Héraclès), and fighter aircraft in N'Djamena (Tchad, Opération Épervier), for instance. As swift as the French Air Force operates, the closure of Aerial Bases is more constant and immediate, having known a strong acceleration since the 1950s. An airbase commander has authority over all units stationed on his base. Depending on the units tasks this means that he is responsible for approximately 600 to 2500 personnel. On average, a base, made up of about 1500 personnel (nearly 3500 people including family), provides a yearly economic boost to its area of about 60 million euros. Consequently, determining the sites for air bases constitutes a major part of regional planning. CABA 117 Paris, air force headquarters until 2015. BA 105 Évreux-Fauville Air Base. Command, operational and logistic support. Air transport units with 27× CASA CN-235M, 18× Transall C-160 NG and 4× Mirage 2000-5F to defend a Paris. Vélizy – Villacoublay Air Base (BA 107). Helicopter and heavy air transport units. Saint-Dizier – Robinson Air Base (BA 113) 4e Escadre de Chasse, Escadron de Chasse 01-007 "Provence" with the new Dassault Rafale C, and EC 1/4 "Gascogne", a conventional/nuclear strike squadron with Dassault Rafale B.
Luxeuil Air Base (BA 116). Air defence fighter base with 24× Mirage 2000-5F. Orléans – Bricy Air Base (BA 123). Air transport units with 14× A400M Atlas and 15× C-130 Hercules. CFPSAA operational command. Nancy - Ochey Air Base (BA 133). Three strike fighter squadrons units with 68× Mirage 2000D, SAM sqns. Châteaudun Air Base (BA 279). Airplane maintenance, repair and storage airbase. Avord Air Base (BA 702). CFAS nuclear strike stockpile. AWACS 4× E-3F Sentry unit. Inflight refueling C-135FR unit. BA 705 Tours airbase. Fighter pilot training school equipped with Alpha Jet. Air Base 106 Bordeaux-Mérignac Airport. Transport support base for the air staff. Air Base 115 Orange-Caritat. Air defence escadron de chasse 02.005 Île-de-France equipped with 10× Mirage 2000C and transition squadron equipped with six Dassault Mirage 2000B. Air Base 118 Mont-de-Marsan Air Base. The base is home to two squadrons Rafale B and Rafale C. Home of CEAM, the Air Force military experimentation and trials organisation, Air defence radar command reporting centre, instruction centre for air defence control. Air Base 120 Cazaux, situated South-west of the port city of Bordeaux. Fighter pilot training squadron equipped with Alpha Jet. Air force airplane stockpile. Air Base 125 Istres. Conventional/nuclear strike squadron, EC02.004 Lafayette equipped with 21× Mirage 2000N – will be transition to Rafale B by September 2018. Two Transall C-160 G strategic communication flight. Inflight refueling unit with 14× C-135FR. CEAM – the Air Force military test centre. Varennes-sur-Allier (DA 277) Air Force supply depot. DA 277 was dissolved on June 30, 2015. Air Base 709 Cognac-Châteaubernard. Basic flight training school equipped with 33× Socata TB-30 Epsilon. Air Base 721 Rochefort. Home of the NCO school, the École de formation des sous-officiers de l'armée de l'air. Air Base 942 Lyon-Mont Verdun. Air defence radar command reporting centre. National Air Operations Command (CNOA) location. EAR 943 Nice Mont-Agel. Air defence radar GM 406. DA 204 Bordeaux-Beauséjour air detachment. Logistic unit. EPA 749 Grenoble. Air force child support school. A E-3F flanked by 5 Mirage 2000 during the military parade of July 14, 2006. BA 160 Dakar, Senegal. Mixed units. Escadron de transport 50, fr:Détachement air 181 La Réunion, Réunion, Indian Ocean. More than ten bases have been closed since 2009. Doullens Air Base (BA 922) was a former command and reporting centre; Toulouse - Francazal Air Base (BA 101), was closed on Sept. 1, 2009; Colmar-Meyenheim Air Base (BA 132) was closed on June 16, 2010; Metz-Frescaty Air Base (BA 128) was closed on June 30, 2011; Brétigny-sur-Orge Air Base (BA 217), closed June 26, 2012; Cambrai - Épinoy Air Base (BA 103), was closed on June 28, 2012; Reims – Champagne Air Base (June 2012); Drachenbronn Air Base (BA 901) closed on July 17, 2015; Dijon Air Base (BA 102), was vacated on June 30, 2016; Creil Air Base (BA 110) vacated on August 31, 2016; and Taverny Air Base (DA 921), the former Strategic Air Forces Command headquarters. Mirage 2000B France Jet Trainer 2000 7 These aircraft are unarmed. Mirage 2000D France Jet Attack 1995 70 2000N variant was retired 21 June 2018. Airbus A400M Atlas EU Propeller Transport 2014 14 14 36 more on order. General Atomics MQ-9 Reaper USA UAV ISR 2013 5 6 10 more on order One of the original 6 crashed in Niger. Fusiliers Commandos de l'Air at the opening of a war memorial. Since the end of the Algerian War, the French Air Force has comprised about 17 to 19% of the French Armed Forces. In 1990, at the end of the Cold War, numbers reached 56,400 military personnel under contract, out of which 36,300 were part of conscription and 5,400 civilians. In 2008, forecasts for personnel of the French Air Force were expected to number 50,000 out of which 44,000 aviators on the horizon in 2014. Non-navigating personnel of the French Air Force include and are not limited to : Systems Aerial Mechanics (French: mécanicien système aéronautique), Aerial Controllers (French: contrôleur aérien), Meteorologists (French: météorologue), Administrative Personnel, Air Parachute Commandos (French: Commandos parachutistes de l'air), in Informatics, in Infrastructures, in Intelligence, Commissioner of the Armies (French: Commissaire) (Administrator Task). Pilots, Mechanical Navigating Officer (French: Mécanicien Navigant), Navigating Arms Systems Officer (French: Navigateur Officier Système d'Armes) (NOSA), Combat Air Medic (French: Convoyeur de l'Air) (CVA). Students of the École de l'air (Air School) during the military parade of July 14th in 2007 on the Champs-Élysées. École de transition opérationnelle (French: École de transition opérationnelle) (Operational Transition School). Aerial Base Officer (French: officiers des bases de l'air), amongst which, officers of the Air Parachute Commandos (French: Commandos parachutistes de l'air) are featured. Military Air Technicians (French: militaires techniciens de l’air) having been trained until July 1, 2015 at the Center of Elementary Military Formation (French: " Centre de formation militaire élémentaire ") of the Technical Instruction School of the French Air Force (French: École d'enseignement technique de l'Armée de l'air) of Saintes. Since July 1, 2015, training has taken place at Orange-Caritat Air Base (BA 115), within the " Operational Combatant Preparation Center of the Air Force " (French: Centre de préparation opérationnelle du combattant de l'Armée de l'air). Air traffic controllers are trained at the Center of Control Instruction and Aerial Defense (French: Centre d'Instruction du Contrôle et de la Défense Aérienne). ^ Designations of Escadrilles composed of the identifying number of material devices (for instance SPA for escadrille equipped with SPAD, N for Nieuport, SAL for Salmson, etc.) and an order number. ^  Archived 5 October 2018 at the Wayback Machine, Hydroplanes Georges Lévy, Gérard Hartmann, 2011, The Schneider cup and veteran hydroplanes. ^ Young(ed),"Command in NATO after the Cold War", 96. ^ Isby, David; Kamps, Charles (1985). Armies of NATO's Central Front. London: Jane's Publishing Company. pp. 168–170. ISBN 978-0-7106-0341-8. ^ "CFIAR". Archived from the original on 3 December 2018. ^ "Chammal : visite du commandant de la brigade aérienne de l'aviation de chasse". defense.gouv.fr. Archived from the original on 21 January 2018. Retrieved 21 January 2018. ^ Décret du 26 avril 2007 Archived 1 January 2018 at the Wayback Machine. ^  Archived 8 April 2015 at the Wayback Machine, Métiers et expertise du SCA, defense.gouv.fr, February 11, 2015. ^ a b c d Nouvelles escadres aériennes : une cohérence opérationnelle accrue, des valeurs renforcées Archived 26 August 2015 at the Wayback Machine. Site de l'Armée de l'air accessed 16 November 2015. ^  Archived 28 June 2015 at the Wayback Machine, Les fusiliers commandos, February 10, 2015, August 2, 2010, defense.gouv.fr; Officier commando de l'air Archived 5 October 2018 at the Wayback Machine. ^ "Le ministère commande la rénovation à mi-vie des Mirage 2000 D". Archived from the original on 24 July 2016. Retrieved 22 July 2016. ^ Scramble Archived 19 January 2013 at the Wayback Machine. Scramblemagazine.nl. Retrieved on 2013-08-16. ^ "Chiffres cles de la Defense 2018". Archived from the original on 13 September 2018. Retrieved 13 December 2018. ^ "Alert 5 " French Air Force retires the Mirage 2000N – Military Aviation News". Archived from the original on 25 June 2018. Retrieved 24 June 2018. ^ "France Confirms Order for Eight MRTT Tankers". defenseupdate.com. 16 December 2015. Archived from the original on 21 August 2018. Retrieved 21 August 2018. ^ "France orders three more Airbus A330 MRTT tankers". airbus.com. 14 December 2018. Archived from the original on 14 December 2018. Retrieved 14 December 2018. ^ Riool, Peter W. "Airbus A400M Full Production List". abcdlist.nl. Archived from the original on 22 December 2017. Retrieved 20 December 2017. ^ "France – MQ-9 Reapers – The Official Home of the Defense Security Cooperation Agency". dsca.mil. Archived from the original on 7 November 2017. Retrieved 3 November 2017. ^ "France –C-130J Aircraft – The Official Home of the Defense Security Cooperation Agency". dsca.mil. Archived from the original on 24 January 2018. Retrieved 23 January 2018. ^ "France speeds PC-21 deliveries". 20 September 2018. Archived from the original on 7 November 2017. Retrieved 3 November 2017. ^ "UNVEILED THE FIRST PILATUS PC-21 FOR FRENCH AIR FORCE". Archived from the original on 7 November 2017. Retrieved 3 November 2017. ^ Bilan social 90, Editor : Direction de la fonction militaire et du personnel civil, 1990, total pages 62, passage 6 to 8 format=PDF Archived 24 September 2015 at the Wayback Machine. Olivier, Jean-Marc, (ed. ), Histoire de l'armée de l'air et des forces aériennes françaises du XVIIIe siècle à nos jours" [History of the Air Force and French aerial forces since the 18th century to the present], Toulouse, Privat, 2014, 552 p.
Pither, Tony (1998). The Boeing 707 720 and C-135. England: Air-Britain (Historians) Ltd. ISBN 978-0-85130-236-2.